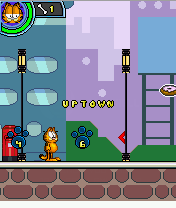 Garfield's Tag Out. . Wallpaper and background images in the Garfield club tagged: garfield day out video game screenshot. This Garfield photo might contain buntglasfenster, glasfenster, glasmalerei-fenster, roulette-rad, rad, and roulette rad.